Particle physicists are on the hunt for light. Not just any light, but a characteristic signal produced by the interaction of certain particles — like ghostly neutrinos, which are neutral fundamental particles with very low mass — with a detector that contains an atomic sea of liquefied noble gases. Even if it were brighter, this light signal would be undetectable by our eyes because it falls in the ultraviolet (UV) range of the electromagnetic spectrum. And just as our eyes are not equipped to see UV light, most conventional photodetector systems for particle physics experiments work much better in the visible range than they do in UV. However, new work at the U.S. Department of Energy’s (DOE) Argonne National Laboratory is bringing the power of nanotechnology to particle physics in an effort to make photosensors work better in experimental environments where UV light is produced, like massive liquid argon-filled detector modules. 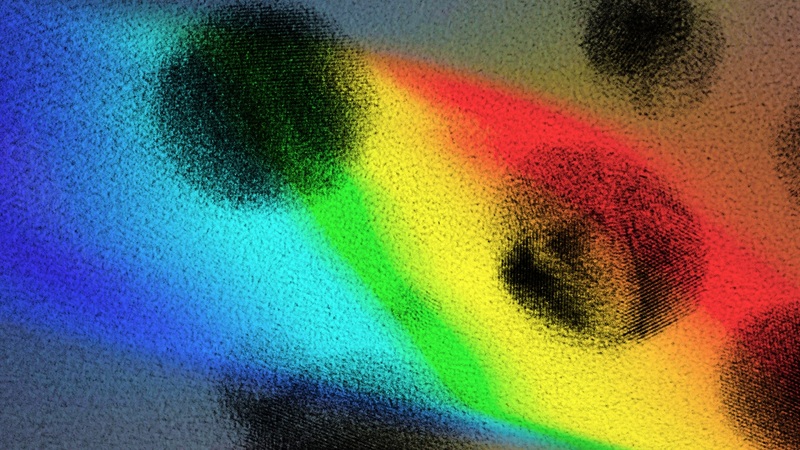 “You can go online and buy photosensors from companies, but most of them are in the visible range, and they sense photons that we can see, visible light,” said Argonne high-energy physicist Stephen Magill. To make their photosensors more sensitive to UV radiation, Magill and his colleagues at Argonne and the University of Texas at Arlington applied coatings of different nanoparticles to conventional photodetectors. Across a wide range of varying compositions, the results were dramatic. The enhanced photosensors demonstrated significantly greater sensitivity to UV light than the coating-free photodetectors. The reason that the nanoparticles work, according to Magill, has to do with their size. Smaller nanoparticles can absorb photons of shorter wavelengths, which are later re-emitted as photons of longer wavelengths with lower energy, he said. This transition, known to scientists as the ​“Stokes shift,” converts UV photons to visible ones. The types of experiments for which scientists use these enhanced photodetectors are considered part of the ​“intensity frontier” of high-energy physics. By being more sensitive to whatever small ultraviolet signal is produced, these nanoparticle coatings increase the chances of detecting rare events and may allow scientists a better view of phenomena like neutrino oscillations, in which a neutrino changes type. The advantages of this kind of new material could also reach beyond the purview of particle physics. Magill suggested that the particles could be incorporated into a transparent glass that could enhance the amount of visible light available in some dim environments. A paper based on the study, ​“Wavelength-shifting properties of luminescence nanoparticles for high-energy particle detection and specific physics process observation,” appeared in the July 12 edition of Scientific Reports. Argonne physicist Junqi Xie collaborated on the research, as well as University of Texas at Arlington scientists Wei Chen, Benjamin Jones, Lun Ma, David Nguyen and Sunil Sahi. The work was funded by DOE’s Office of Science (Office of High Energy Physics) with additional support from the National Science Foundation and the U.S. Department of Homeland Security. Experimental particle physicist with expertise in calorimetry, QCD and jet physics, neutrino oscillations and innovative UV light detection.